The laces made in Belgium during World War I are an important part of the lace holdings of the Division of Home and Community Life's Textile Collection in the Smithsonian's National Museum of American History. They are representative of laces made by about 50,000 lace makers, many of whom were women, throughout Belgium from 1914 through 1919, especially during the Great War. In August 1914, the German army invaded and occupied Belgium. When Great Britain set up a blockade of the Belgian borders to prevent supplies from reaching Germany through Belgium, seven million Belgian people were cut off from imported food and other needed supplies. After the start of World War I the Commission for the Relief in Belgium (CRB) was established with Herbert Hoover, a wealthy industrialist living in London at the time, as chairman. Hoover, later U.S. President (1929-1933), was instrumental in negotiating with England and Germany for the delivery of much needed food shipments to Belgium. The negotiations also included the importation of thread for the Belgian lace makers and the export of the lace made from this thread. Orders for and deliveries of war laces were managed through the CRB office in London. Numerous people in the Allied countries were generous in their willingness to buy the laces to support the Belgians. The Belgian lace committees worked closely with the CRB, especially as the lace makers' work became even more important during the war. Several famous Belgian artists were enlisted to create new designs. Among them were Isidore de Rudder, his sister Maria de Rudder, Charles Michel, and Juliette Wytsman, who designed some of the war laces that are now part of the collection at the National Museum of American History. World War I laces often included names of people, places, inscriptions, and dates—a characteristic not usually found in other lace work. The lace often incorporates the coats of arms or national symbols of the Allied nations, as well as the nine Belgian provinces, in recognition of the help received. It was hoped that these distinguishing elements would appeal to generous people around the world who might buy these laces in support of the Belgians. Most of the laces in the collection at the National Museum of American History were bought in Europe by American collectors and donated to the Museum. Lace is an ornamental openwork fabric created by looping, twisting, braiding, or knotting threads either by hand or by machine. The main categories of handmade lace are needle lace, bobbin lace, and decorated nets. Needle lace is created by making looped or knotted variations on the buttonhole stitch with a threaded needle on top of a pattern. Bobbin lace is created by twisting, crossing, or plaiting multiple threads wound on bobbins. It is also made on a pattern, sometimes called a pricking. Bobbin and needle techniques can be combined in the same piece of lace. Bobbin- and needle-made lace motifs can also be applied to handmade or machine-made nets. During the 17th and 18th centuries the handmade lace industry played an important part in the economy of many European countries. Lacemaking was mostly a cottage industry with individual lace makers working in their homes for a lace dealer, who would supply the threads and patterns and collect the finished lace from the lace maker. Producing a handmade piece of lace is very time consuming, making the delicate fabric a very expensive and desirable fashion accessory. Members of royalty and the aristocracy were the customers for the fine laces, with both men and women competing to display the most exquisite lace on their fashionable clothes in the 17th and 18th centuries. However, by the end of the 18th century, men had stopped wearing lace, and fashion shifted to a much simpler, unadorned dress for women, so the demand for lace was rapidly declining. Additionally, the Industrial Revolution saw the development of machines for making lace that brought an end to most of the opulent handmade lace industry. One of the lacemaking centers of Europe that suffered from the advances in machinery wrought by the Industrial Revolution was Flanders. Belgium's Queen Elisabeth was concerned about the decrease in demand for handmade lace, so in 1910 and 1911 she helped establish lace committees specifically to improve both the quality and the designs of the lace, as well as to better the lives of the lace makers. Another committee was established for promoting the sale of Belgian lace abroad: the Queen noticed that handmade Belgian lace enjoyed a renewed interest, especially among Americans. Committee members included the Vicomtesse de Beughem, an American married to a Belgian nobleman, Madame Kefer-Mali of Brussels, and Mrs. Brand Whitlock, wife of the American Envoy (later Ambassador) to Belgium. Some of the laces in the war laces collection have connections to these three generous women. Lacemaking in America occurred primarily among European immigrants, who practiced their craft in communities all over the country. The only documented large-scale handmade lacemaking industry in the U.S. was in Ipswich, Massachusetts, in the late 18th century. That industry also came to an end with changes in fashion and the development of lace machines in the early 19th century. Currently lacemaking traditions are being kept alive by modern lace makers who research and create lace as a hobby. Credit for the written content of this section goes to Karen Thompson and Doris Bowman from the Division of Home and Community Life. Anne Kraatz, Lace: History and Fashion (New York: Rizzoli, 1989). Charlotte Kellogg, Bobbins of Belgium (New York: Funk & Wagnalls Company, 1920). Charlotte Kellogg, Women of Belgium: Turning Tragedy to Triumph, 2nd ed. (New York: Funk & Wagnalls Company, 1917). George H. Nash, “Herbert Hoover and Belgian Relief in World War I,” Prologue Magazine 21, no. 1 (Spring 1989). Heather Toomer, Antique Lace: Identifying Types and Techniques, illustrated ed. (Atglen, PA: Schiffer Publishing, 2001). Karen Thompson, “The Bayeux Tapestry at the Smithsonian? Yes, but who made it, when, where and why?,” O Say Can You See? Stories from the National Museum of American History (blog), September 20, 2012. Karen Thompson, "The delicate 'war laces' of World War I," O Say Can You See? Stories from the National Museum of American History (blog), August 19, 2015. Karen Thompson, “The finer details of the Hapsburg Imperial Bridal Veil,” O Say Can You See? Stories from the National Museum of American History (blog), June 22, 2011. Santina M. Levey and Victoria & Albert Museum, Lace: A History (London: Victoria & Albert Museum, 1983). “The Humanitarian Years,” Herbert Hoover Presidential Library & Museum. “World War One Laces,” National Museum of American History online object group. This round tablecloth is decorated with the American and Belgian shields, and the Whitlock family crest. Mr. Brand Whitlock was the American envoy and later ambassador to Belgium from 1914 to 1921. Mrs. Brand Whitlock worked tirelessly on behalf of the Belgian lace makers during World War I. The center of the tablecloth is Old Flanders style bobbin lace with needle lace ground. The same lace pattern is used in TE*T14468A and TE*T14468B. A wide border of point de Venise style needle lace surrounds the four shields. Belgian lace makers made this tablecloth during World War I. This pillow top was designed by the Belgian sculptor Isidore de Rudder (1855-1943). The design of starfish, crabs, and eels in seaweed with the central inscription “1914 Yzer 1915” commemorates a famous battle at the Yzer River, where Belgian engineers prevented the German troops from advancing by manipulating the locks on the Yzer River to flood the surrounding fields. This pillow top in point de Venise style needle lace was made by Belgian lace makers during World War I. The pattern is preserved in the Royal Museum of Art and History in Brussels. This fan leaf is monogrammed A for Belgian King Albert I and E for Queen Elisabeth surmounted by the Belgian royal crowns and encircled by laurel as a symbol for victory. The dates 1914-1915 are on a shield held by the Belgian Lion in the center of the fan leaf below the Belgian and American flags. The names of the designer Juliette Wytsman, and the manufacturer and dealer Maison Daimeries-Petitjean are worked into the design. The fan leaf is an example of fine quality Point de Gaze needle lace made by Belgian lace makers during World War I. The fan leaf has never been mounted to fan sticks. 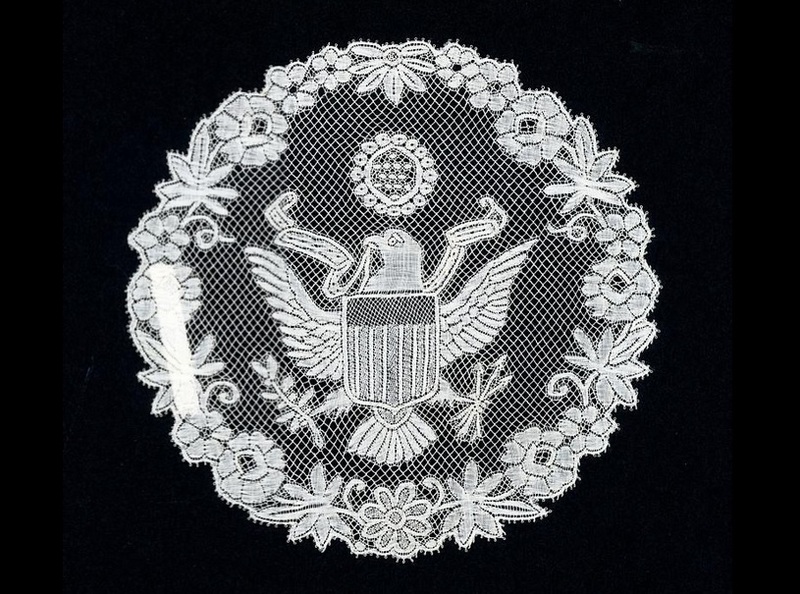 Part of a set of six, this Valenciennes bobbin lace medallion focuses on the American eagle motif. Two other medallions with the Belgian lion coat-of-arms, two with the municipal shield of Ruysselede (Ruiselede) in the Belgian province of West Flanders; and another with the American eagle complete the set. See a similar motif in TE*E383967. Belgian lace makers made these laces during World War I. Part of a set of six, this Valenciennes bobbin lace medallion features the coat-of-arms of Belgium. Other medallions, two with the American eagle, another with the Belgian lion coat-of-arms, and two with the municipal shield of Ruysselede (Ruiselede) complete the set. See a similar motif in TE*E383967. Belgian lace makers made these laces during World War I. The leaf pattern on this border is made in the Valenciennes square mesh bobbin lace technique in cotton thread. It has a two and one-half inch long pattern repeat. The edges are straight with picots on one side and unfinished ends. It was identified by the donor as lace made by Belgian lace makers during World War I. This fan leaf was designed for the Belgian Lace Committee by Belgian painter Charles Michel. His name is worked in needle lace into the ground (reseau) along the inner edge. The central motif of helmet, swords and weaponry is flanked on either side by the war years 1914 and 1915. The rising sun, laurel leaves and other floral motifs are also included. Brussels bobbin lace was mainly used for the motifs and connected with Point de Gaze type needle lace. Belgian lace makers made this fan leaf during World War I. It has never been mounted to fan sticks. This fingerless mitt, one of a pair, is handmade of white cotton in Chantilly style bobbin lace with floral motifs. A ribbon is added along the top edge. The back of the mitt is fastened with a small button. The mitt matches TE*T14221B and was identified by the donor as lace made by Belgian lace makers during World War I.